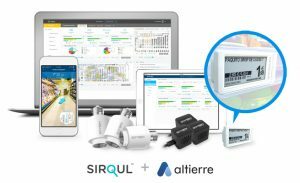 Altierre and Sirqul Announce Strategic Alliance to Help Shoppers Locate Items In-Store — Sirqul, Inc.
SAN JOSE, Cal­if.–(BUSINESS WIRE)–Altier­re Corp and Sirqul today announced a strate­gic glob­al alliance at Retail World Con­gress in Madrid. The alliance brings togeth­er Altierre’s lead­ing Inter­net of Things (IoT) plat­form and Elec­tron­ic Shelf Labels (ESL) with Sirqul’s IoT plat­form and loca­tion-based Edysen tech­nol­o­gy to give retail­ers a smart, effi­cient solu­tion for locat­ing items and shop­pers in their stores. By com­bin­ing Altierre’s wire­less in-store IoT plat­form and ESLs with Sirqul’s patent­ed Edysen loca­tion intel­li­gence and IoT plat­form, retail­ers can now trans­form the in-store expe­ri­ence and make indi­vid­u­al­ized pro­mo­tion­al offers to shop­pers based on their exact indoor loca­tion, behav­ioral insight, and purchase/loyalty his­to­ry. Sirqul’s ground­break­ing tech­nol­o­gy enables Altier­re to deliv­er an Aug­ment­ed Real­i­ty (AR) appli­ca­tion. As a stand­alone solu­tion or native inside the retailer’s loy­al­ty app, the nev­er seen before func­tion­al­i­ty allows shop­pers to pre­cise­ly locate speci­fic items in-store while pro­vid­ing rec­om­men­da­tions and pro­mo­tion­al offers. 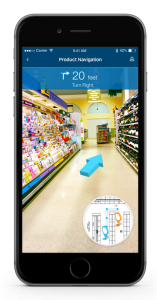 Retail­ers will also take advan­tage of the new AR app to enable asso­ciates to pick and pack prod­ucts for Buy Online and Pick­up in Store, Ship from Store, and Curb­side Deliv­ery. Sirqul’s tech­nol­o­gy can mon­i­tor shop­pers’ with or with­out an app to view paths in the store, under­stand dwell times, and provide heat maps of store traf­fic to opti­mize staffing, store lay­outs, and pro­duct loca­tions. Retail­ers are cur­rent­ly exper­i­ment­ing with exist­ing tech­nolo­gies to accom­plish the­se objec­tives, such as com­put­er vision and video ana­lyt­ics. Sirqul’s solu­tion is less expen­sive and more effec­tive with a high­er degree of accu­ra­cy. Lever­ag­ing AI to ana­lyze shopper’s traf­fic pat­terns will help retail­ers opti­mize their planogram. Mar­ry­ing this data with POS data will give retail­ers a gran­u­lar pic­ture of shop­per activ­i­ty, which they can lever­age to opti­mize planograms on a store-by-store basis. Sirqul (www.sirqul.com) pro­vides an Engage­ment-as-a-Ser­vice IoT Plat­form with Smart Mesh net­work tech­nol­o­gy to dri­ve engage­ment, oper­a­tional effi­cien­cy rapid inno­va­tion and new rev­enue streams. At the foun­da­tion of Sirqul’s plat­form are 75 Ser­vices, 350 APIs, 3 dis­tinct IoT hard­ware pro­duct offer­ings, and over 30 cus­tomiz­able native appli­ca­tion tem­plates for rapid deploy­ment on a build­ing block approach. Sirqul is – device, pro­to­col and cloud agnos­tic – fos­ter­ing an inter­op­er­a­ble sys­tem for build­ing future-proof solu­tions for retail, auto, cities, build­ings, indus­tri­al, enter­tain­ment, and more.